Ferrari will take the wraps off its fastest ever road car, the Ferrari 599 GTO, at the Beijing motor show later this month (April 2010). The Ferrari 599 GTO is an exclusive limited edition special which, in true Ferrari tradition, is a completely new concept, albeit inspired by a production car. In fact the 599 GTO is based on the 599XX, the advanced experimental track car, and can be considered almost a road-going version. 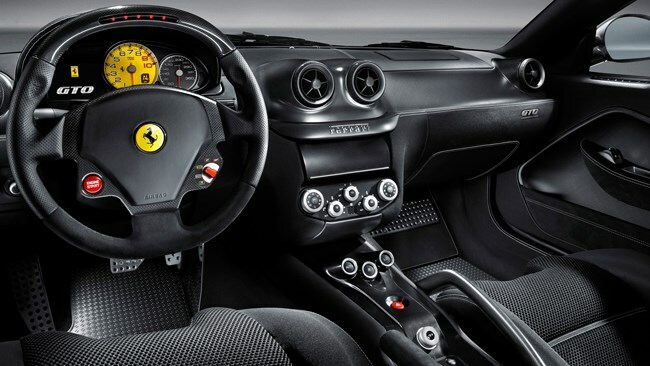 The 599 GTO will be reserved for just 599 clients who seek the maximum expression of high performance driving. The 599 GTO benefits directly from the technological transfer from racing and set a record lap time at Fiorano in 1'24". The Fiorano lap time provides just one indication of the potential of this car. As for the technicals – 670 hp in a 1495kg car represents a weight-to-power ratio of just 2.23 kg/hp, and ensures a 0-100 kmh acceleration time of just 3.35" as well as a top speed of over 335 kmh. Fundamental to the GTO's performance is the innovative approach to chassis development which, for the first time on a production car, saw the integration between a handling set-up tuned for a level of responsiveness that is close to the limit and highly sophisticated electronic controls. The result is the almost complete absence of understeer and a truly communicative chassis. The 599 GTO is also equipped with the latest, second-generation carbon-ceramic brakes which are lighter and offer better performance, new aerodynamic innovations, such as the wheel doughnuts which increase aerodynamic efficiency as well as improve brake cooling, and a different tyre set-up with wider front tyres for greater roadholding. The driver-car interface is also new with the adoption of the Virtual Race Engineer (VRE) which provides the driver with instantaneous information on performance. The 599 GTO's more aggressive character is also apparent in a number of styling elements that recall the 599XX and from the powerful sound of the V12. The GTO (Gran Turismo Omologata) moniker instantly calls to mind two Ferraris that have entered the collective imagination as symbols of performance. After the 1962 250 GTO, which swept the boards in GT racing categories in the 1960s and is now a highly prized collector's car, came the iconic 1984 GTO, which many claim practically invented the entire modern supercar genre. The Ferrari 599 GTO will arrive in Australia and New Zealand in early 2011.